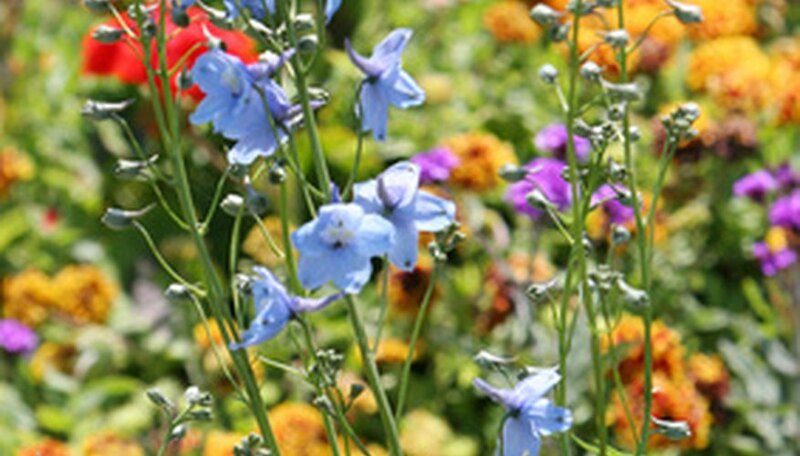 Annual and perennial flowers require little care and provide gardeners with blooms all season long. Perennial flowers take two to three years to mature and flower, but once mature, they'll live for 10 years or more, depending on the variety. Perennials may bloom from early spring to late summer. Some varieties, such as daylilies, bloom almost all summer long. Annuals live only one summer in temperate climates, but most bloom all summer. There's no secret to blooming flowers; just give them what they want and wait patiently. Consult a local extension office or nursery specialist to select flowers that grow well in your area. Select plants with a variety of bloom times so you have flowers all summer long. Consider the amount of sun you have in your garden, as well as the soil type and moisture level. Choose plants that are naturally well-suited for your garden. Lay 2 to 3 inches of compost on the soil and dig it in thoroughly with a shovel before planting your flowers. Most flowers like a well-drained, loamy soil. Adding compost improves soil's texture, fertility and drainage. Plant perennials in early to late spring by transplanting nursery plants. Plant annuals after the last expected frost. Pinch off blossoms once they are spent (deadheading) to encourage new blooms. Discard dead leaves and blooms to minimize the chance of disease. Water your flowers two or three times weekly during dry periods until the soil is evenly moist, but not soggy. Most flowers prefer evenly moist soil, although some, such as astilbes, like damp soil. If you live in a dry area, choose drought-tolerant plants, such as sage, Jupiter's beard and salvia. Adjust your watering schedule to reflect individual plant needs. Fertilize flowers with a granular flower fertilizer in early spring when growth first appears and mid-summer, according to package directions. Spread fertilizer on the ground, taking care not to get it on the plants' roots and leaves. Water with a sprinkler for 20 minutes to activate the fertilizer. Fertilize container plants every three weeks. Mow flowers, such as phlox and coneflower, back after they bloom in June. They'll come back and bloom again in late summer. Dig up and divide perennials, such as daylilies and lavender, every three to four years. They'll bloom more productively and be healthier. The most common reasons for a flower not blooming are too little or too much water and/or sun, the plant is not mature enough to bloom or the the plant's blooming season has not yet been reached. Deer and rabbits wreak havoc in flower gardens. Choose deer-resistant varieties if you have wildlife in your yard. Most strategies for deterring them are expensive and ineffective. Always follow planting instructions for specific plants. Space plants so they have 4 to 6 inches between them to promote good air circulation and prevent disease. Water plants in the morning and avoid getting the leaves wet as this promotes disease. Don't work in the garden when it's wet.